Countdown to Grand Give Away 2016 – 5 weeks. Ken’s Kitchen: Steamed Bok Choy Pork Besides being healthy, this is a nice light meal. Perfect for lunch. In the month of April we posted a whopping 160,900 miles for the 1 Million Mile Quilted Postcard Challenge! More on that later, including the reveal of April’s mystery location. First, it’s that time of month to show you some of the cards I received in April on the theme “Work of My Hands”. Your creativity never ceases to amaze me. Marnie was on a road trip and felt challenged by her lack of tools but look what she ended up with. 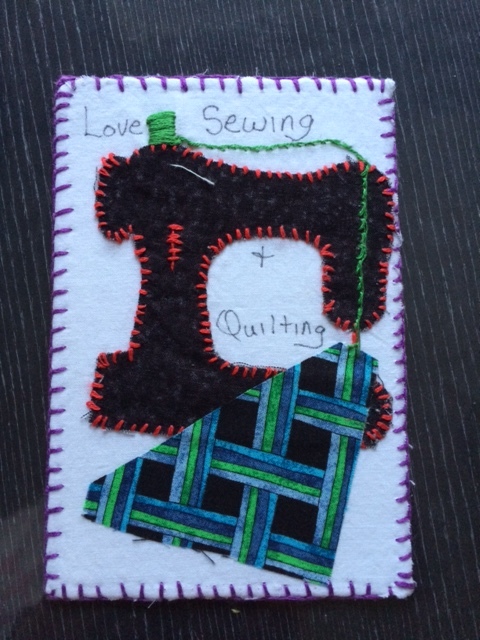 I love the details she put on her card – even the thread and knobs on the sewing machine. Donna sent a bright sunny landscape card. It makes you want to be there sitting on the rocks by the river, looking at mountains in the distance on a nice bright sunshiny day. Spring is definitely here. Laurel (from the blog Laurelsstitches) made a card that was suppose to be called April Showers but she said it is now called April Mistakes. I don’t see any mistakes here. Love the personality and the little butterfly charm that completes it. It went through 2 mail systems and remained intact with all the beads accounted for. Finally, Virginia took “work of my hand” literally. 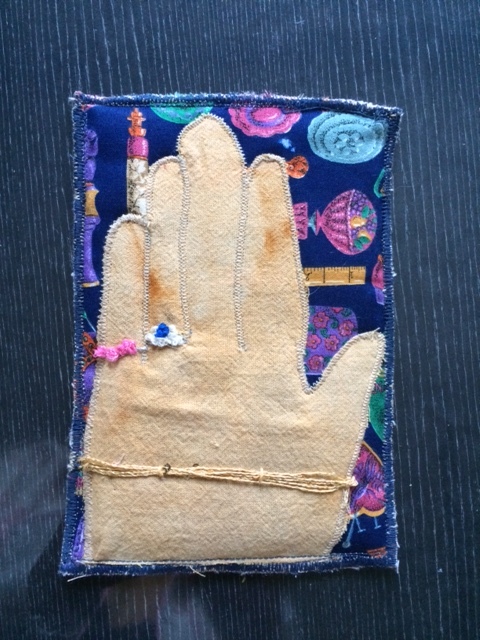 She sent a card with a tracing of her left hand, including rings and bracelet. She states that her left hand helps her create. How ingenious. We can all be thankful for our hands! The mystery location for mailing my April postcards was The Fullerton Hotel in Singapore. The Fullerton Hotel used to be a General Post Office and is considered Ground Zero for postal services in Singapore (according to the tour guide). They continue to receive mail in red pillar post boxes that were first introduced in 1873 and serve as a legacy to the British colonial era. 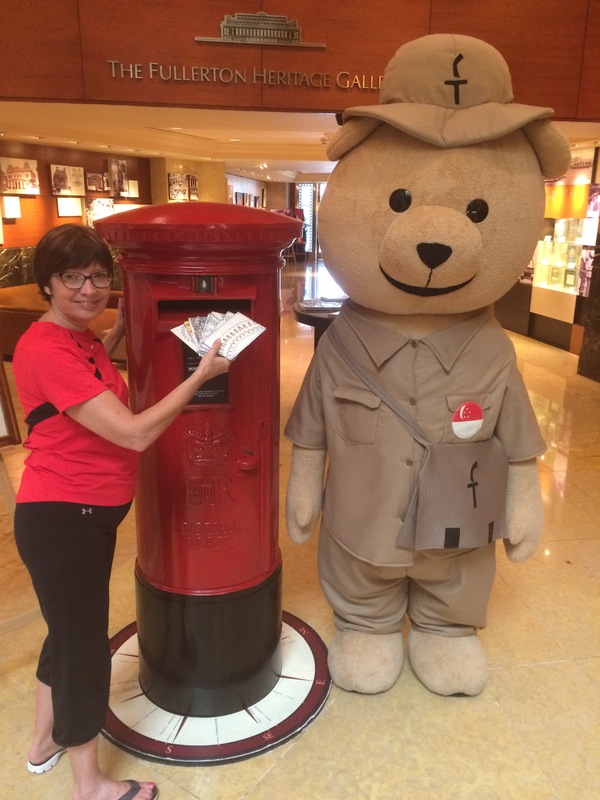 All mail posted there will receive a special postmark – their mascot, a giant teddy bear. Cards were also mailed from Penang, Malaysia and Ho Chi Minh City, Vietnam. Next week I will show you some of the quilting items I purchased and other artistic sources of inspiration from the trip. Remember May is ‘Quilt Industry Appreciation Month’. Why not look at those business cards you have collected from road trips or holiday locations and send them a card letting them know how much you enjoyed their store. Or how about the quilting magazines you read, on-line stores you order from, or teachers who made a difference in your quilting life. Don’t you think they would like to hear about it? Let them know they are receiving the card as part of the 1 Million Mile Challenge and remember to let me know the miles/locations so that they can be included in our totals. Thanks for stopping by. Have a great creative week. 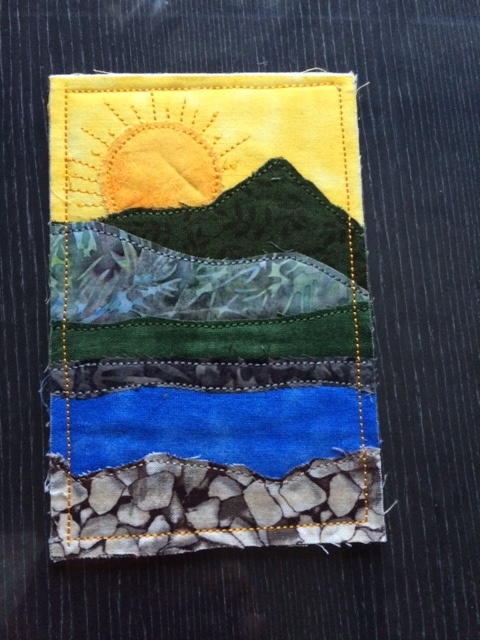 This entry was posted in quilted postcards, recipes, travels, Uncategorized and tagged mystery locations. Bookmark the permalink. Thanks for your ideas on who I can appreciate in May. I will definitely be mailing a few cards back to my Arizona Quilt shop friends. Once you start a list it may be difficult to stop. There are so many people who enable our habit! 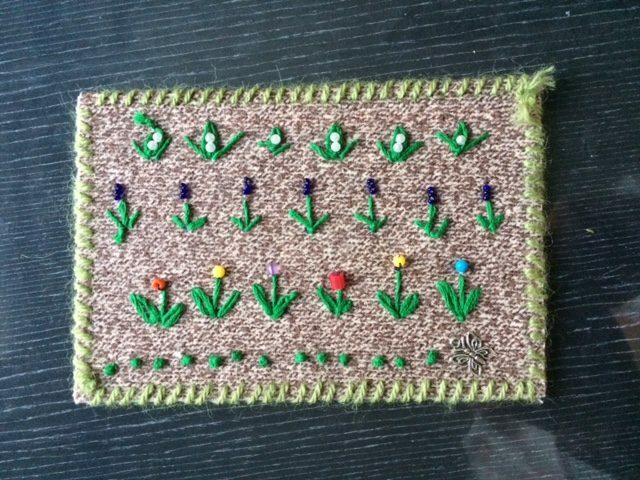 I am happy that I finally finished a card that I started for your Million Mile Challenge, Judy! I had a lot of fun making it (in a hotel room) and then realizing I needed something that took me to a new community or store (or library) to find what I needed! I am happy you finished it too! Like you, I was stitching in hotel rooms, by the pool, in airports and on airplanes. Travel destinations have also taken on a whole new dimension with this project. Instead of going on excursions, our first task is to find a post office. It’s fun.